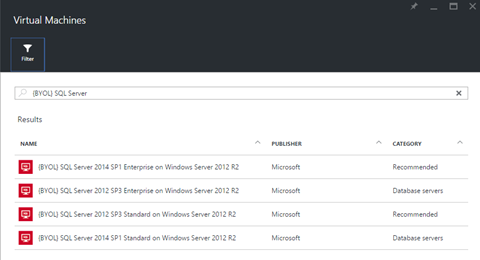 I am super exited to announce that starting today, Microsoft Enterprise Agreement customers can bring existing licenses to run SQL Server on Azure Virtual Machines. Since the launch of Azure Virtual Machines, customers can already run SQL Server on Azure Virtual Machines through several existing SQL Server images available in the Azure Gallery, or bring their own images to Azure. These images and capabilities will continue to be supported so customers can continue to take advantage of pay per use licensing for SQL Server on Azure Virtual Machines. Starting this week, customers with Enterprise Agreement who already have SQL Server Licenses, can use them on Azure Virtual Machines with Microsoft-certified (BYOL) gallery images. These images will not charge for SQL Server licensing, just for compute cost. With this announcement, Microsoft Enterprise Agreement customers will have access to new set of gallery images that they can use with their existing SQL Server licenses and deploy VMs with them. This provides the flexibility, convenience, ease of use and additional cost savings to Microsoft Enterprise Agreement customers. Reusing an existing SQL Server license reduces the cost for our customers running SQL Server workloads continuously or for extended periods of time. 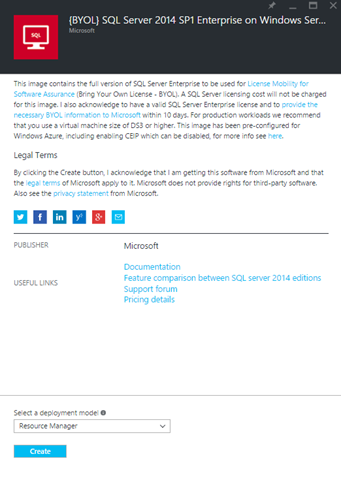 There is no need to build custom images to migrate SQL Server to Azure Virtual Machines. Instead, customers can provision VMs from one of the above images and add their existing license – Enterprise Agreement subscription is required. Customers can also leverage these Microsoft-certified BYOL images to leverage the rich automation features of Portal, Azure QuickStart GitHub templates (i.e. storage configuration, optimization for Transactional Processing, Data Warehousing, Automated Backup and automated Patching). Customers can also choose to deploy their SQL Server VMs through the gallery directly or using their favorite client tool such as Azure PowerShell, Azure CLI – Command Line Interface or through the Azure SDKs. In response to customer feedback, you can now login to your Enterprise Agreement subscription and provision SQL Sever based VMs using your existing license(s). Learn more on our documentation page.